The best place around! 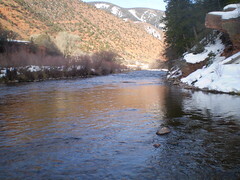 Close to the Pan, private water access, fishing decor, nicely priced and Robin is the great! 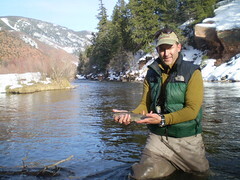 Brian Yamauchi thanks for your flies, they definitely did the trick! garcia's rojo midges # 18 - #22. Check these out, especially the Frying Pan Anglers, these guys are great and very helpful! 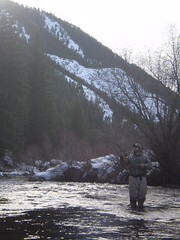 When it's late February, you're ready for a break from the slopes or in search of great fishing...where do you go? 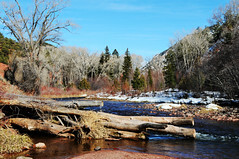 None other than the Frying Pan River near Basalt Colorado. 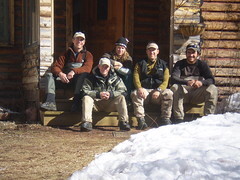 What makes this place so unique is the fact that it's a year round gold medal fishery located right in our backyard. Well, sometimes that backyard has a lot of snow in it, but every so often you get lucky enough to hit it just right and Wham! 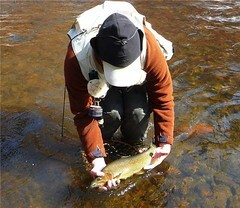 Perfect weather, few crowds, epic hatches and most importantly.....awesome fishing! Everyone it seems caught a fair amount of fish which averaged anywhere between 15-30 fish days, that's a good day for anyone during the Summertime, but for Winter Wow!! 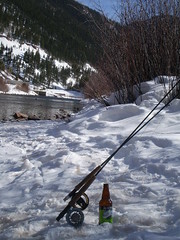 Time for a beer break, yes the snow was cold enough to keep my Alaska Pale Ale's cold but the warm weather out evened it all out. 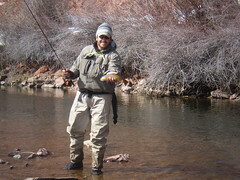 Todd didn't have any problems catching fish, than again he never does. 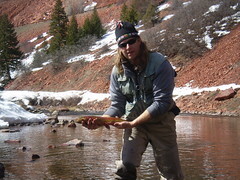 This is one of many fien Rainbows he caught fishing the lower section on Friday. 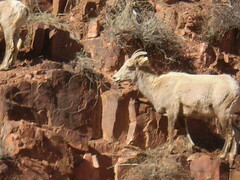 These guys got an extra day on us and had a few stories to tell at the Cabin Friday night. These guys tore it up on Friday and from their expressions that night, I think everyone was eager to hit the water early Saturday for more incredible fishing. 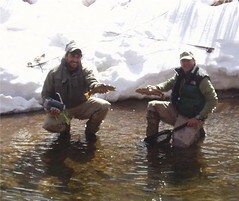 First was 2 nice browns Doubled up by Troutdawg and Nick! 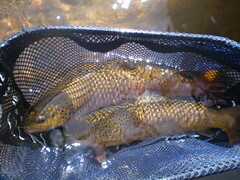 Than 20 minutes later we had our what 3rd or 4th double of the day with another nice Brown and Bow. Gotta love doubles on a day like this. The boys getting into more fish in the upper section. Nick when he wasn't filming didn't seem to have a problem getting into some action and landing a few betweem takes. In the backdrop Steve was also catching a bunch of fish and landing this nice Rainbow on a secret fly and though it looks smaller in the picture it actually was a really nice fish and took a bit to come in. Click here for our Exciting Video from our Pan trip and some incredible footage of some Pan Bows Rising to the occassion! 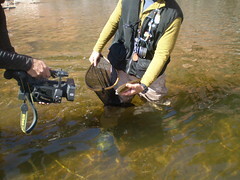 Our Video was also shot by fishing pal Nick Clement from Reelescape Films during our unbelievable weekend of fishing! Check it out and stay tuned to more videos on the way. 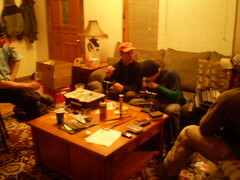 The Guys at our midnight Fly Tying Round table, boy can that Casey tye some flies! We definitely got a lesson in tying and a few new variations to tryout over teh weekend. Nick also getting after a few risers we chased towards the Castles area on our last night there. What a night it was, we had the entire area to ourselves and plenty of fish to cast to. Too bad yours truely took a slippery step and went down on the water, yep I got a little wet and froze my tail off for short period before resisting the Risers and headed back to the car to change. 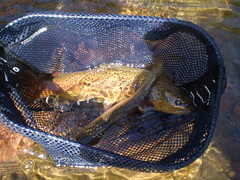 to have happen and and I always seem to get dialed into to atleast a few trout from time to time. I did loose a very nice fish on Sat and though it's par for the course in this big fish water, I'm still thinking of Nemo that got away due to my rusty winter skills.....hmmm kind of reminds me of buddy from last June (now lives in Minn) that missed a butte of a beast that slipped through the legs and our net was too small to grab it OUCH! Can't wait to get back to the Pan and continue that 3-4x a year and hopefully be able to hit it about 5x this year if I'm lucky enough. You either love the Frying Pan or hate it, how again would someone dislike it??? Oh yeah it has a few people, well I'm sure after your 25th take on the day all is forgotten.